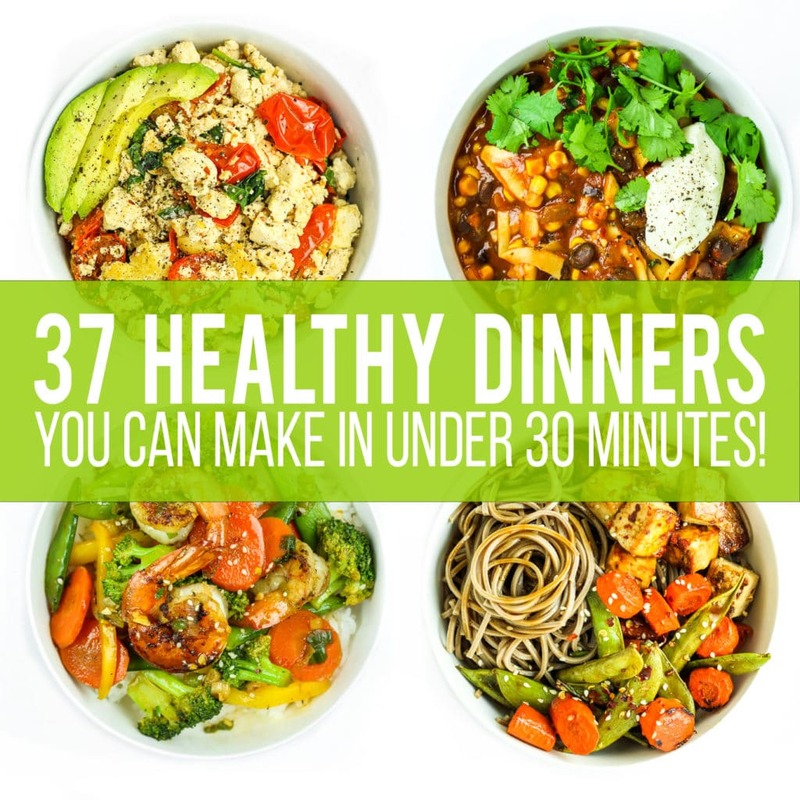 This is the ultimate list of easy, healthy weeknight dinners – every single recipe takes 30 minutes or less to cook! Soups and lettuce wraps, stir fries and one pot dinners, and everything in between! There is a whole section dedicated to vegan meals and a separate section for non-vegan options. 20 minutes to make. 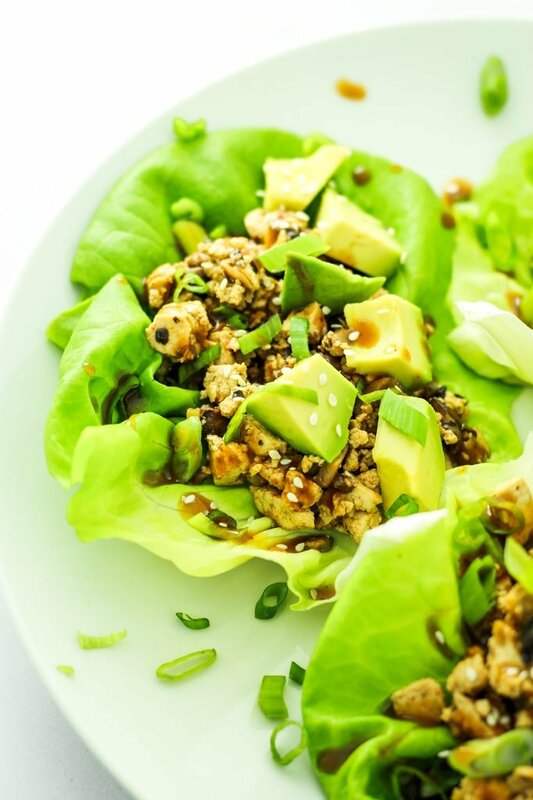 This mushroom + tofu mixture is perfect in lettuce wraps or tortillas. Great for meal prep! 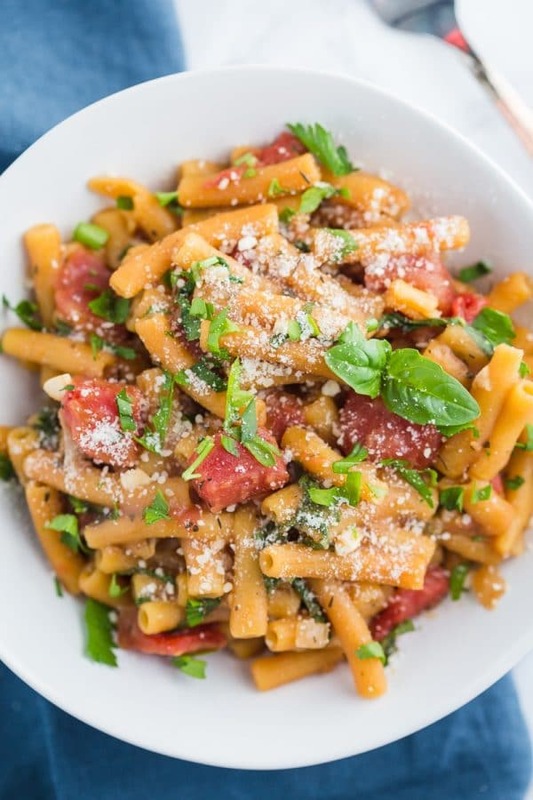 This easy and quick pasta dinner comes together all in one pot! 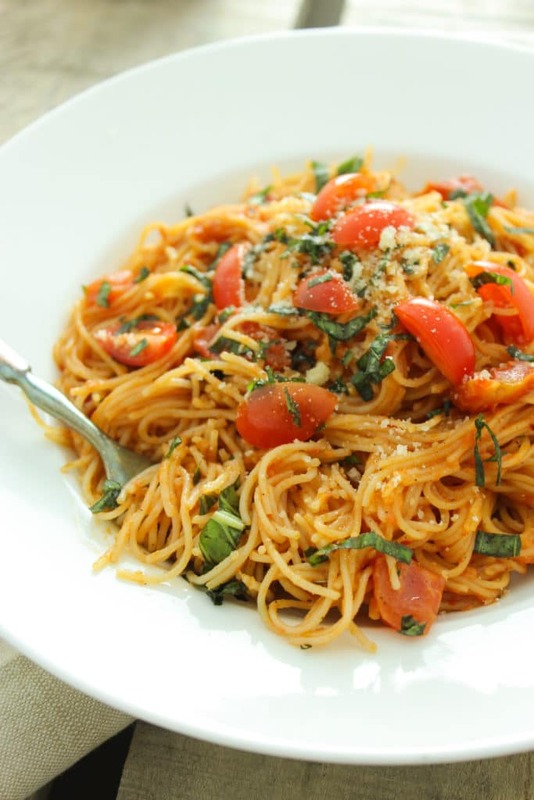 I love using lentil or chickpea pasta for extra protein. Click here to get the recipe from Food with Feeling. 30 minutes. 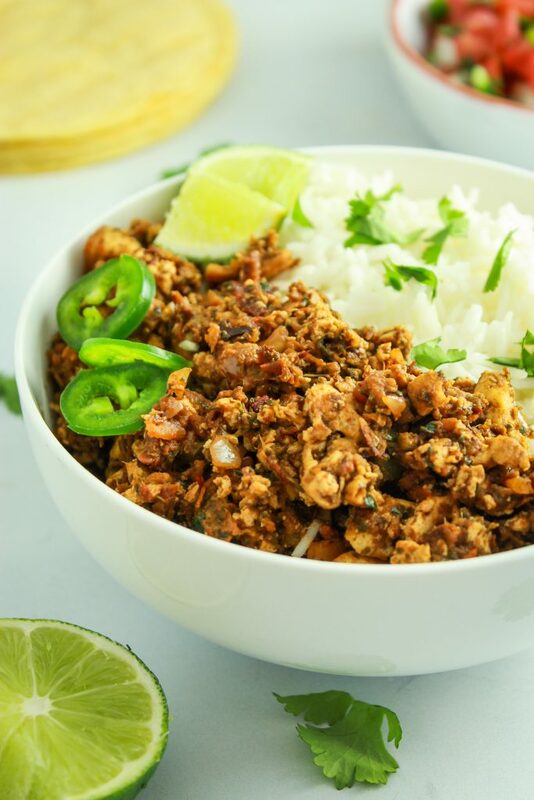 Better than chipotle and oh-so-easy to make. Great for dinner and perfect for meal prep! Green curry. In under 30 minutes. Ummm… YES. 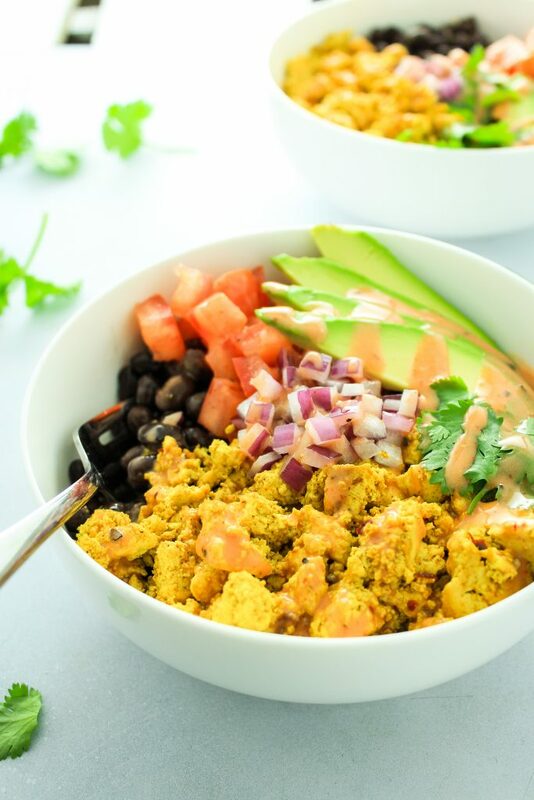 Load this up with your choice of veggies and protein to make it your own! Click here to get the recipe from Gimme Some Oven. 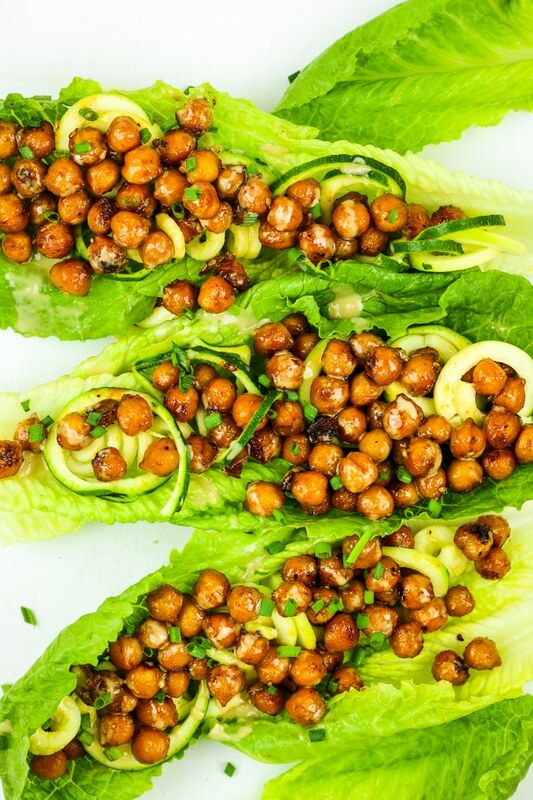 Chickpeas wrapped in the most irresistible sauce and piled high on crunchy lettuce leaves. You’ll definitely be having more than one. 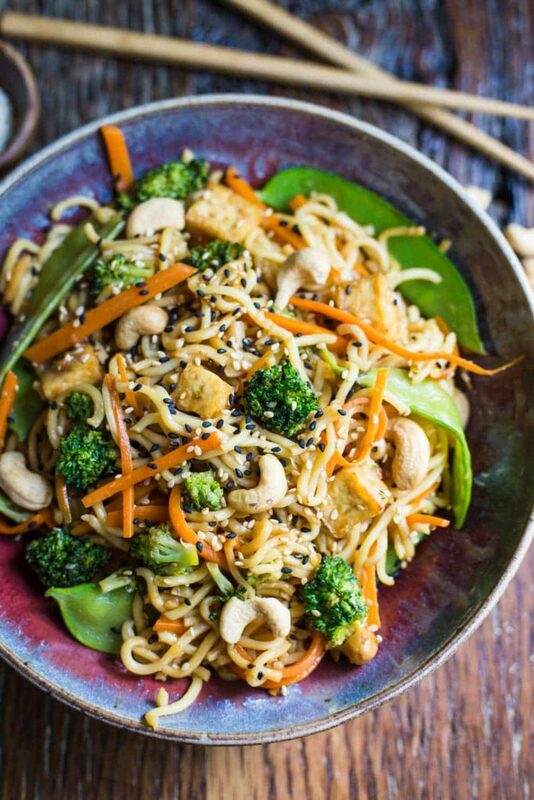 Who needs takeout when you can make your own healthy, easy lo mein at home? Save money and stay in! 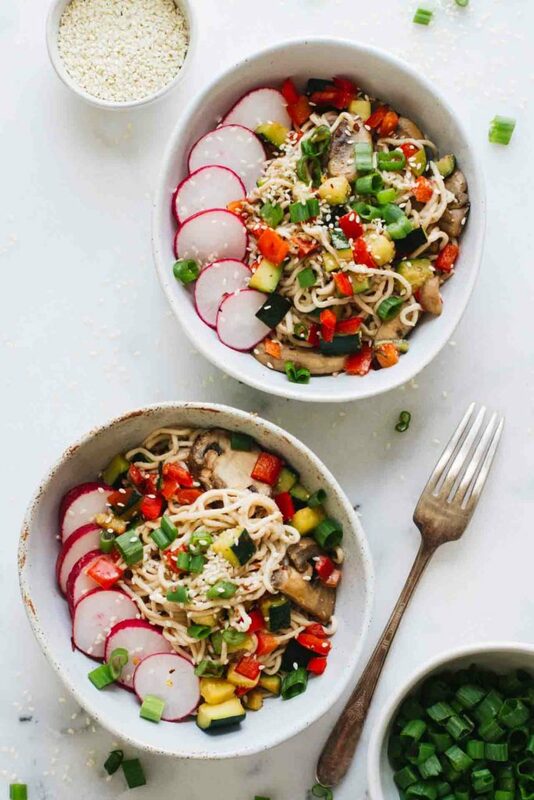 Another veggie packed noodle bowl! The sesame tahini sauce situation here is AMAZING. Click here to get the recipe from Jar of Lemons. 25 minutes! 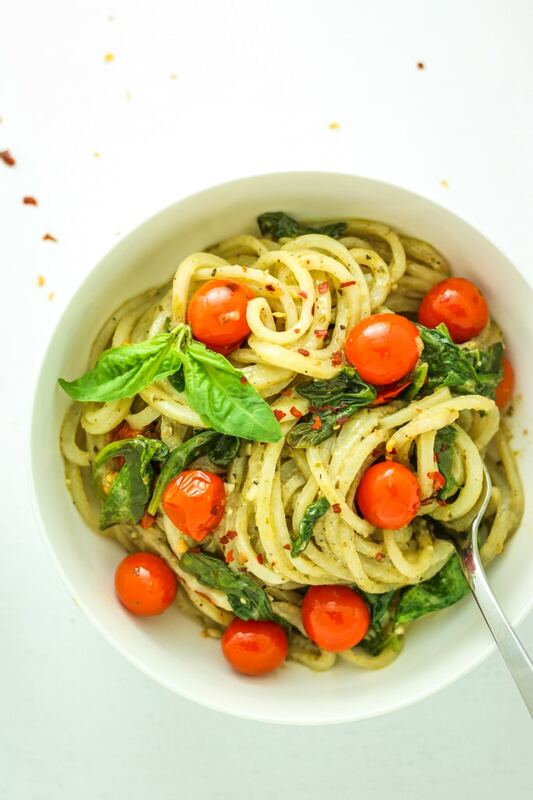 Low carb dinner option with a creamy dairy-free pesto sauce. Hello… crispy, crunchy pizza perfection! Done in less than 20 minutes. Click here to get the recipe from Eating Bird Food. 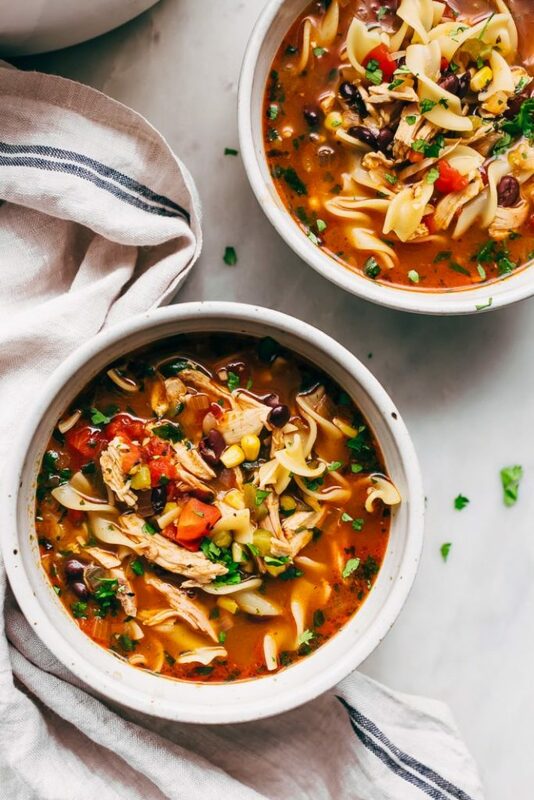 And THIS is why we love our Instant Pot! 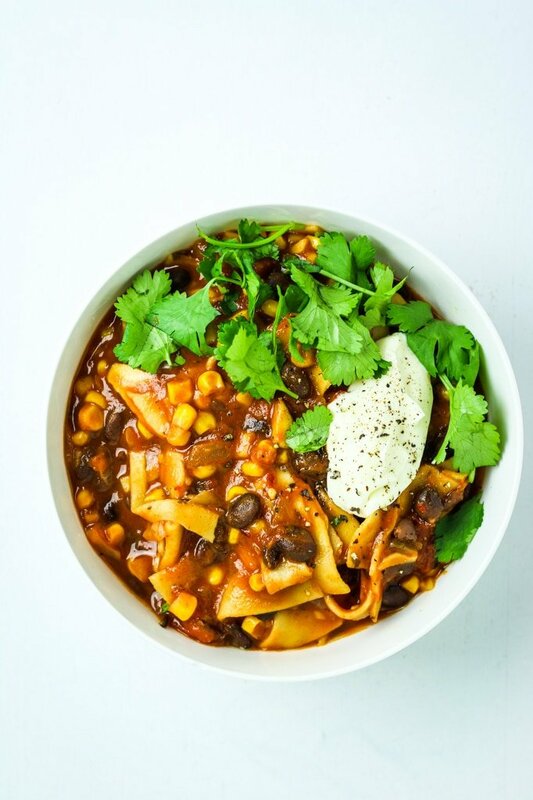 This insanely good vegan chili comes together all in one pot, in under 20 minutes. 15 minutes and one skillet! 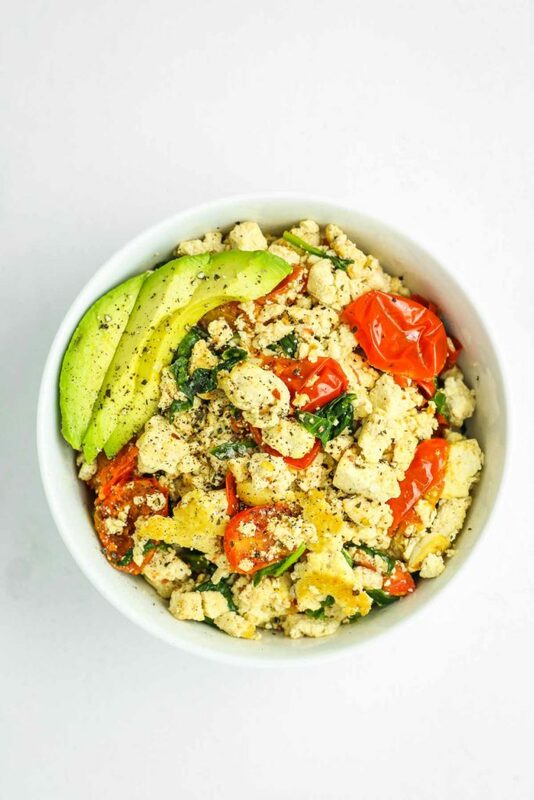 This tofu scramble is delicious on it’s own, or on top of a flatbread or toast. 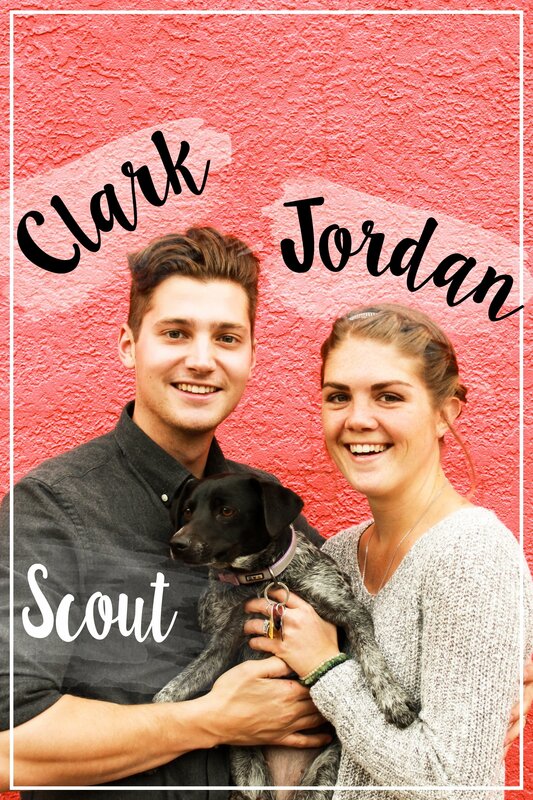 30 minutes! 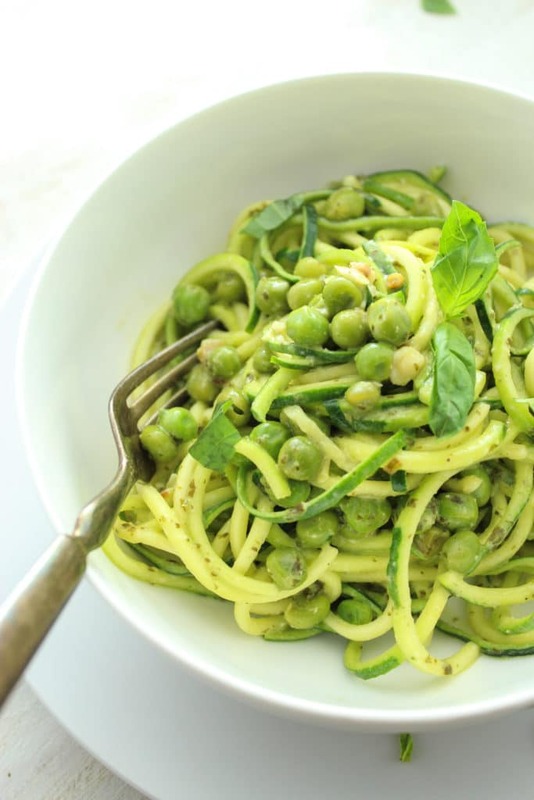 Use your spiralizer to create potato noodles OR boil pasta. The sauce is AMAZING! Click here to get the recipe from Salt and Lavender. 30 minute, one-skillet dinner. Perfect for meal prep, too! 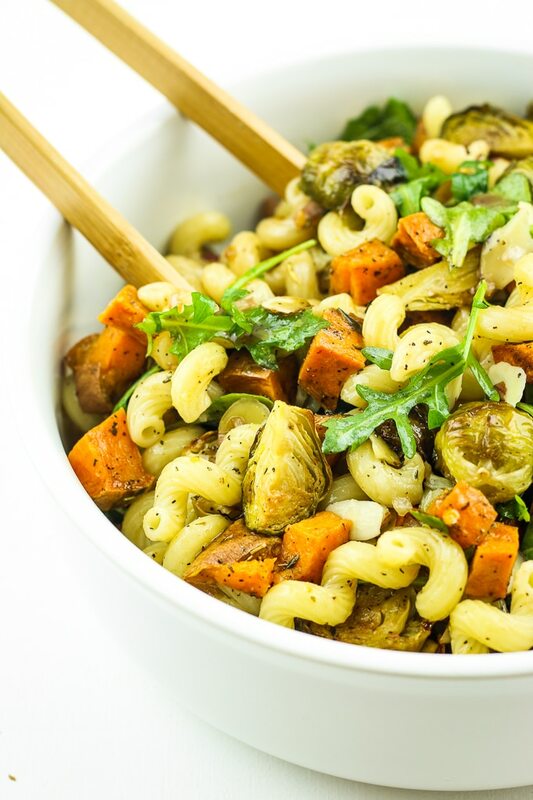 Just 30 minutes of total cooking time and you have an amazing warm pasta salad dinner! Roasted brussels sprouts and sweet potatoes are the perfect combo. 15 minutes… obviously! 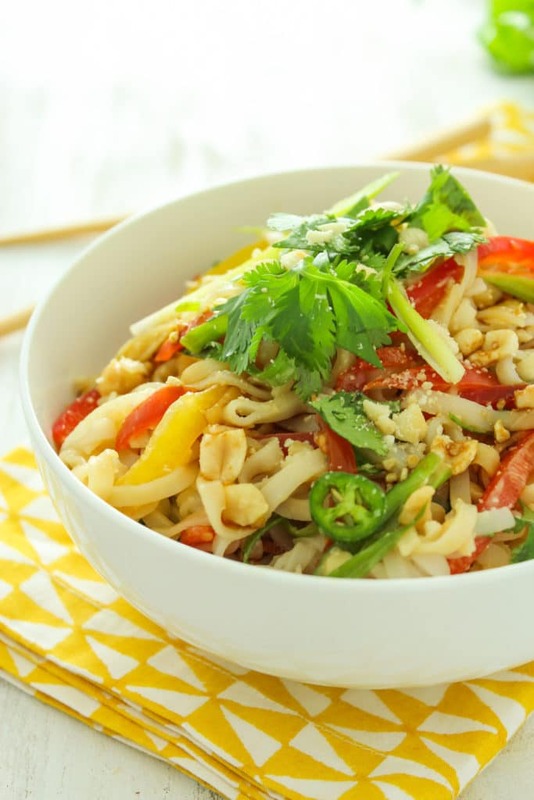 This Thai salad is so flavorful – it’s one of my all-time favorite recipes. 30 minutes! 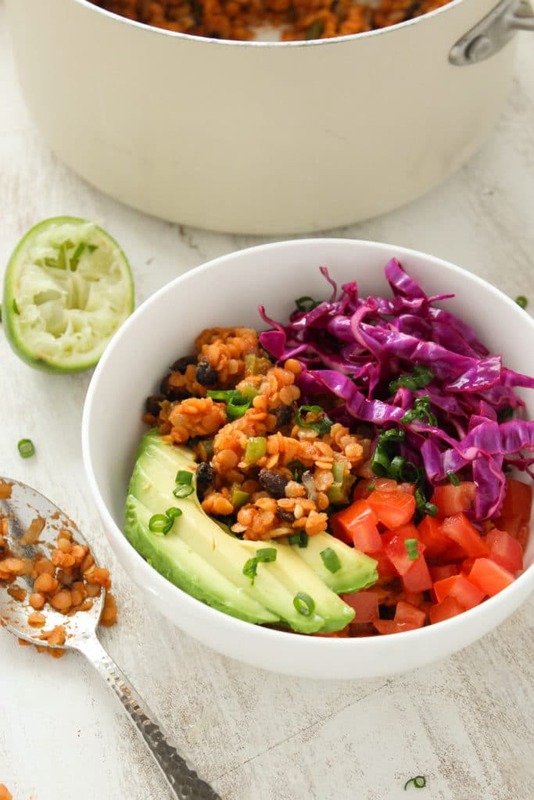 This Mexican-spiced lentil taco “meat” is perfect for bowls, tacos, burritos, and meal prep. 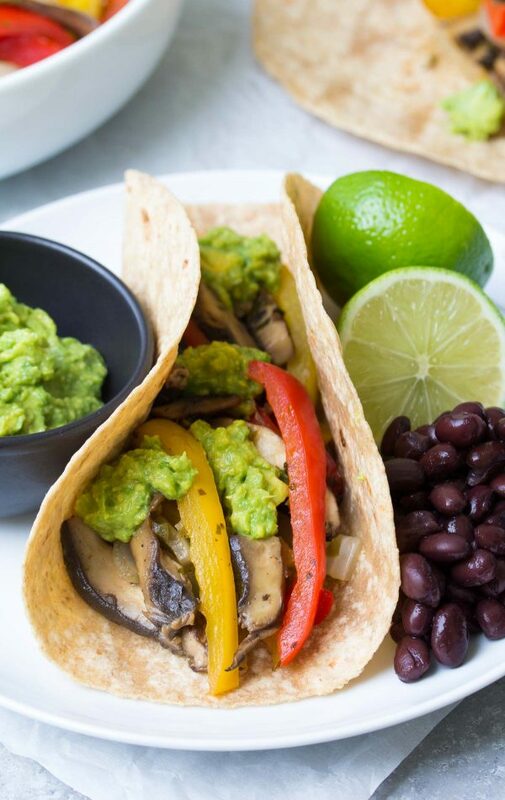 These simple fajitas are a great veggie packed dinner. Stuff them into tortillas or serve them up in a burrito bowl! Click here to get the recipe from Kristine’s Kitchen Blog. 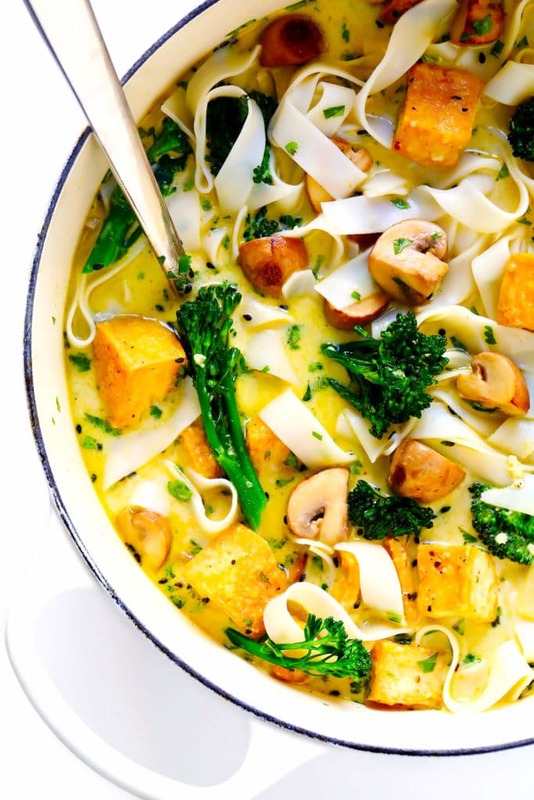 20 minutes to the best one pot pasta ever. Perfect for date night! 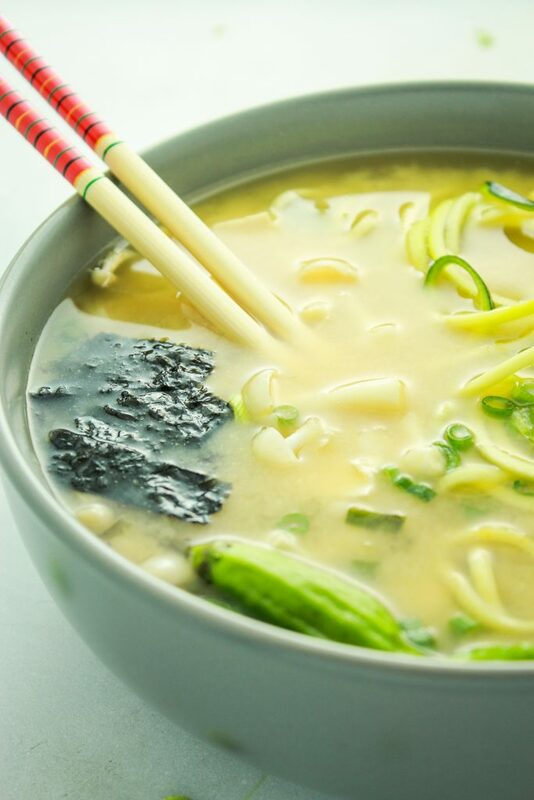 20 minutes, one pot, and you’ll never go back to eating takeout miso soup again. 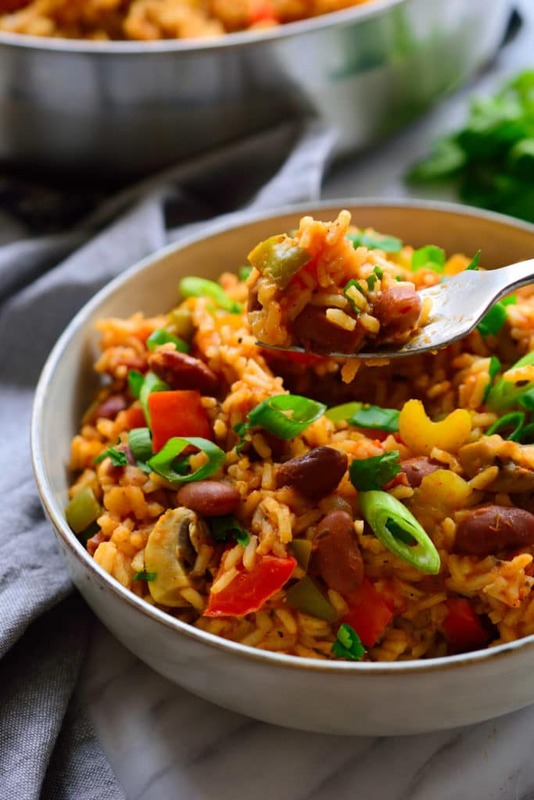 All of the bold cajun flavors, without the meat! It’s on the table in 30 minutes! Click here to get the recipe from The Stingy Vegan. 25 minutes to spicy taco town! This cauliflower is also ideal for meal prep. 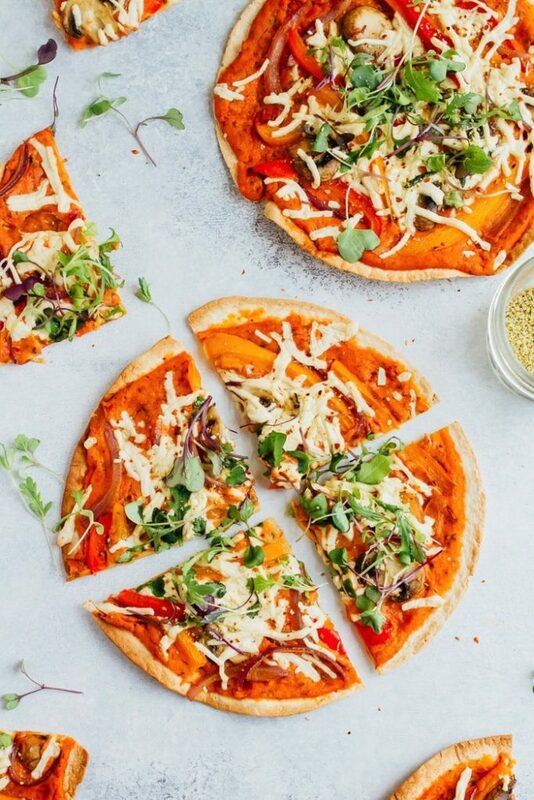 A great low-carb alternative to regular pizza! 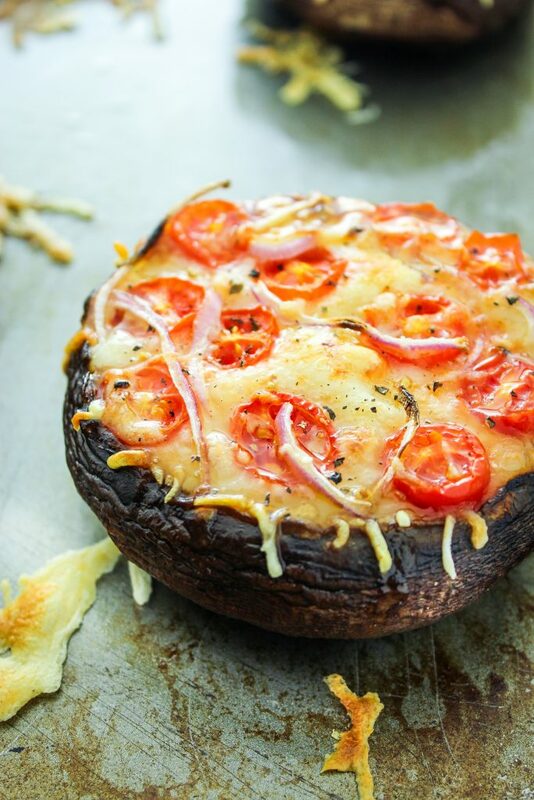 Load up portobello caps with sauce, cheese, and your favorite toppings for a quick dinner. 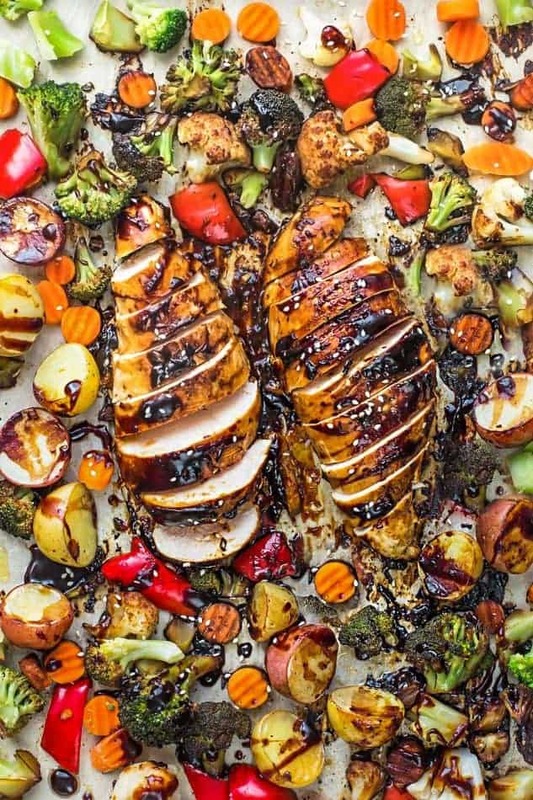 This sheet pan dinner gets a boost of savory thanks to the hoisin marinade. Mix it up and choose your favorite veggies! Click here to get the recipe from Life Made Sweeter. 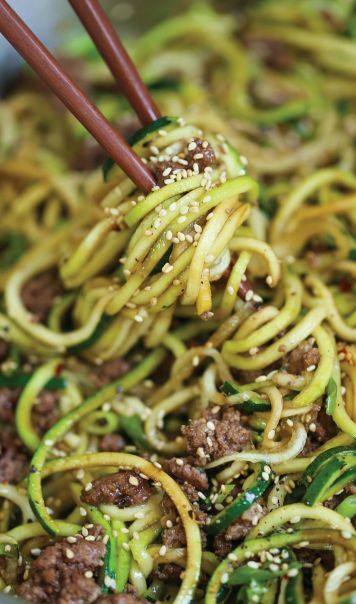 This 20 minute zucchini noodle dish is one of my all-time favorites! It’s spicy, savory, and so filling. 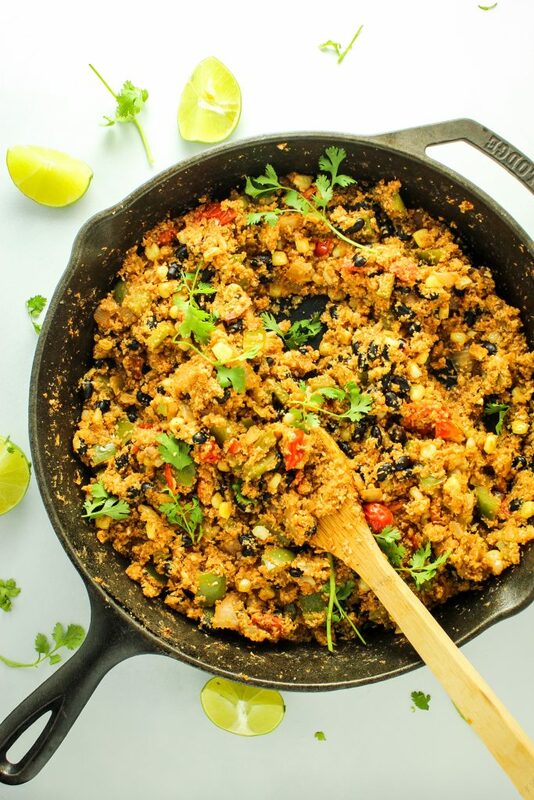 This Mexican version of a comfort food favorite is perfect for chilly nights! Click here to get the recipe from Little Spice Jar. Another weeknight lifesaver! 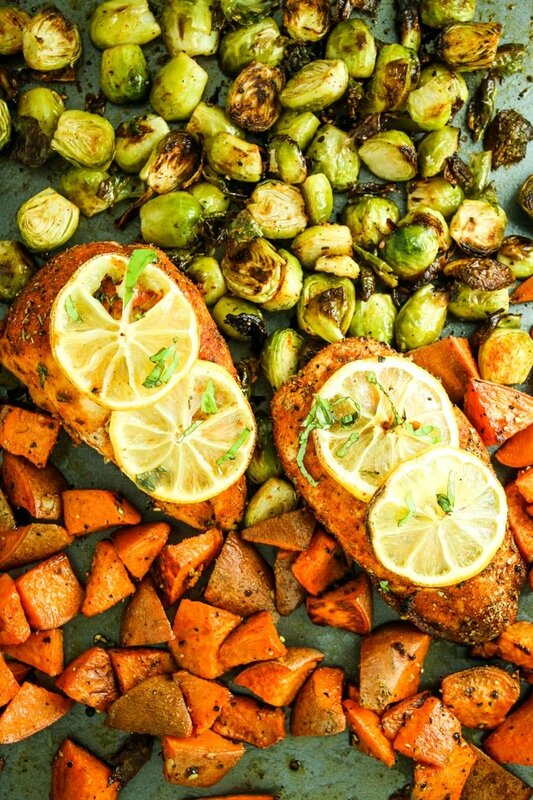 Spicy chicken, brussels sprouts and sweet potatoes all cooked on one pan and on the table in 30 minutes. 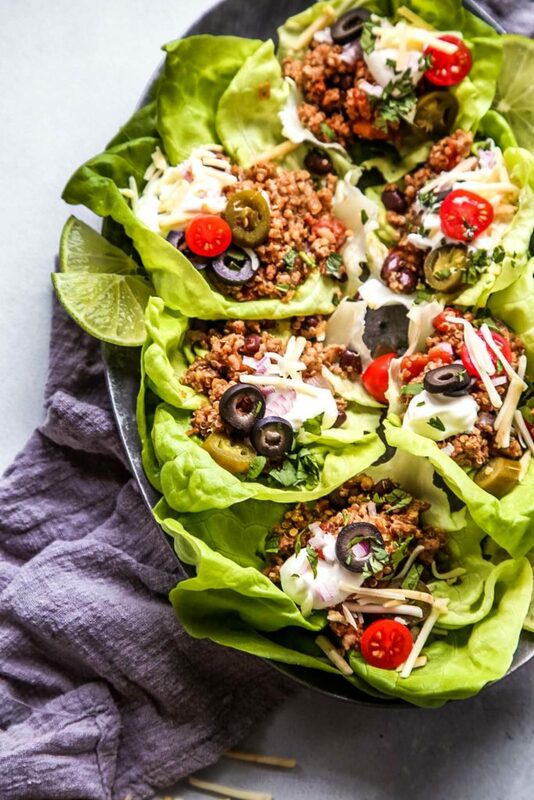 These turkey lettuce wraps get an extra protein boost from the quinoa. 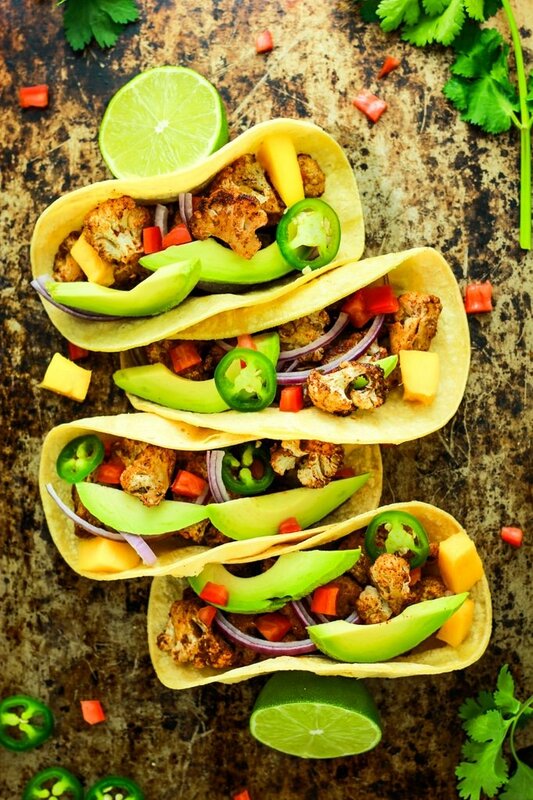 Taco night made healthier! Click here to get the recipe from Platings and Pairings. 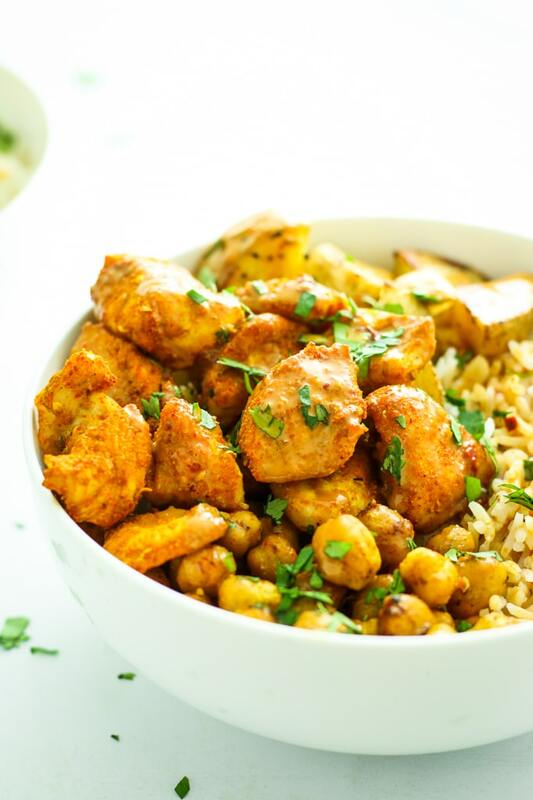 Roasted chicken, chickpeas, and potatoes seasoned with Indian spices and wrapped up in the best peanut sauce! All in under 30 minutes. 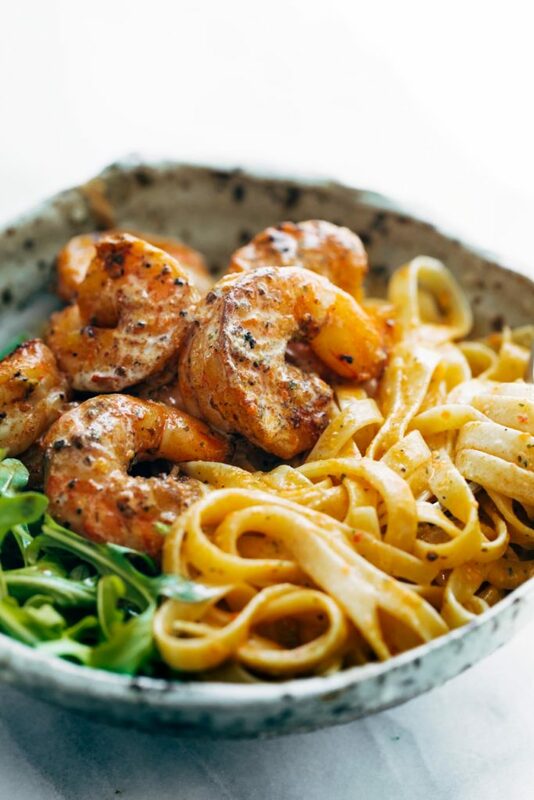 Red pepper cream sauce, seared shrimp, and al dente pasta? I’m sold. Click here to get the recipe from Pinch of Yum. This all-in-one dinner comes together in under 30 minutes. 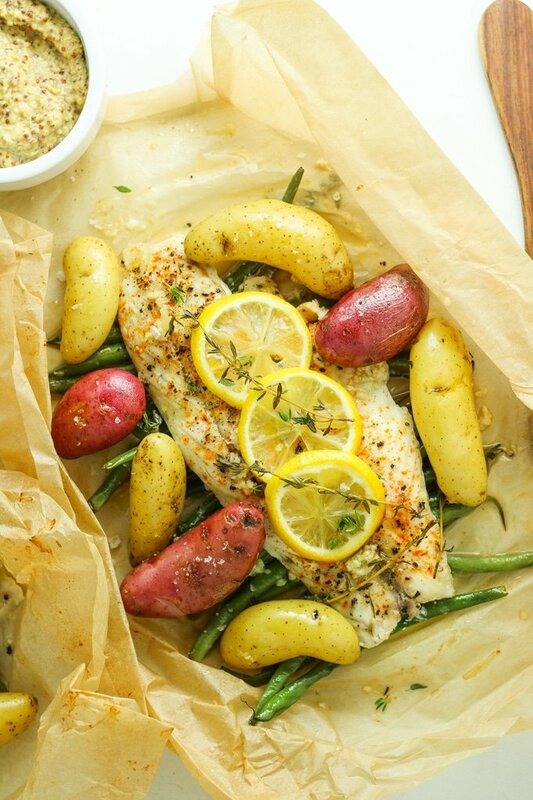 Delicious flaky fish, green beans, and buttery fingerling potatoes! 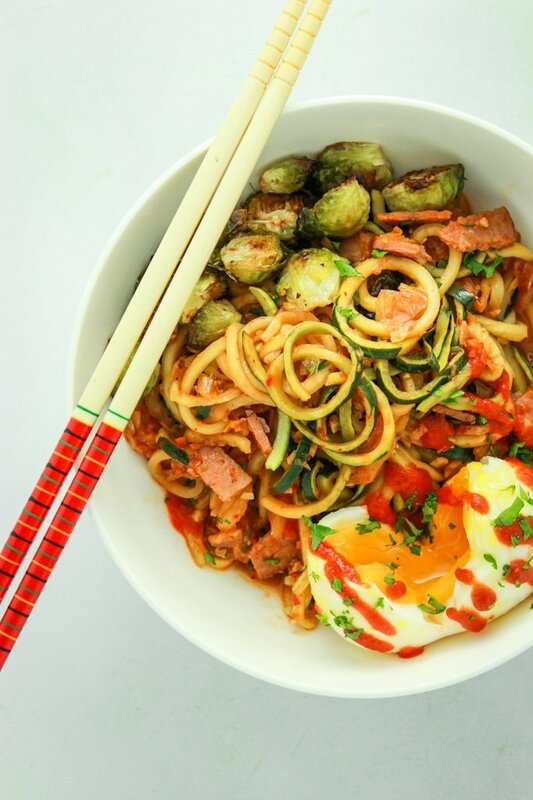 This quick ramen dish is comfort food heaven! 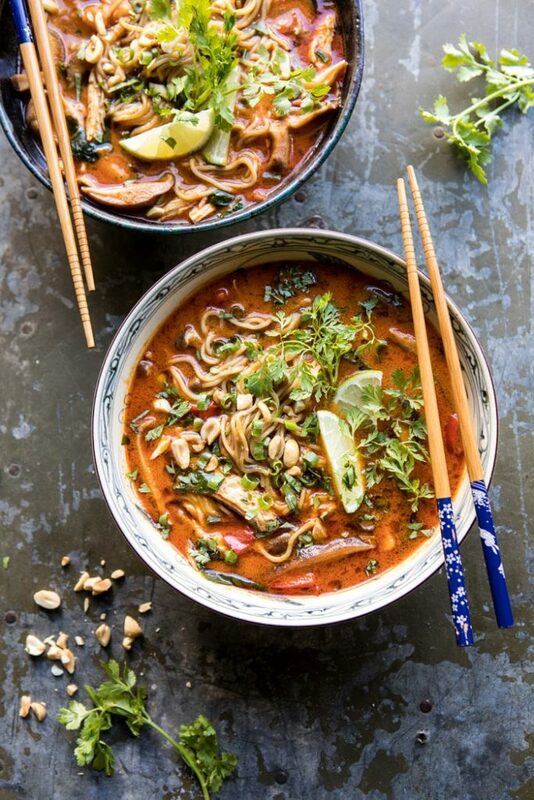 The peanut adds delicious richness to the broth. Click here to get the recipe from Half Baked Harvest. 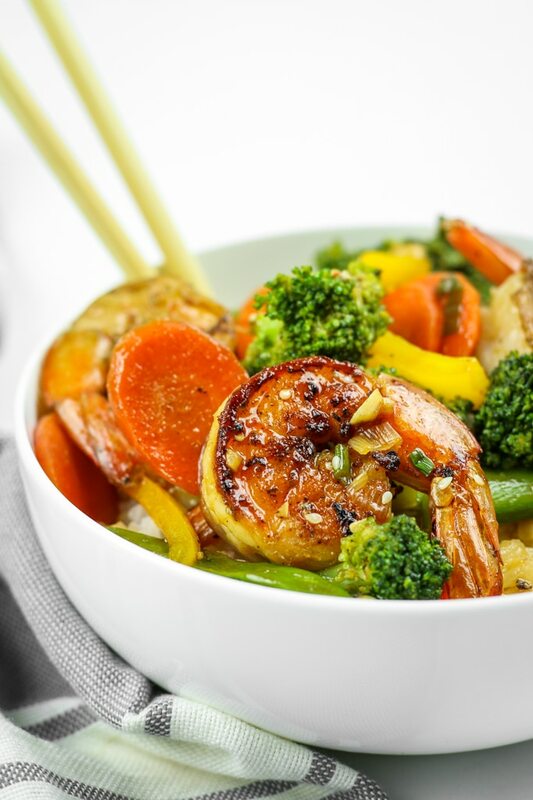 This 30 minute stir fry is made with a delicious sweet and spicy sauce. You can sub whatever protein you prefer for shrimp! 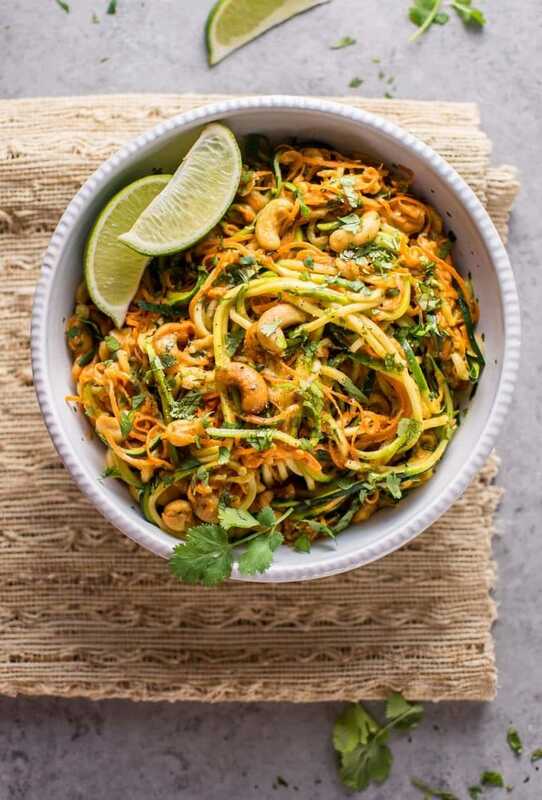 Break out your spiralizer for this low carb dinner! This simple recipe is a weeknight staple. Click here to get the recipe from Damn Delicious. Hello, breakfast for dinner! 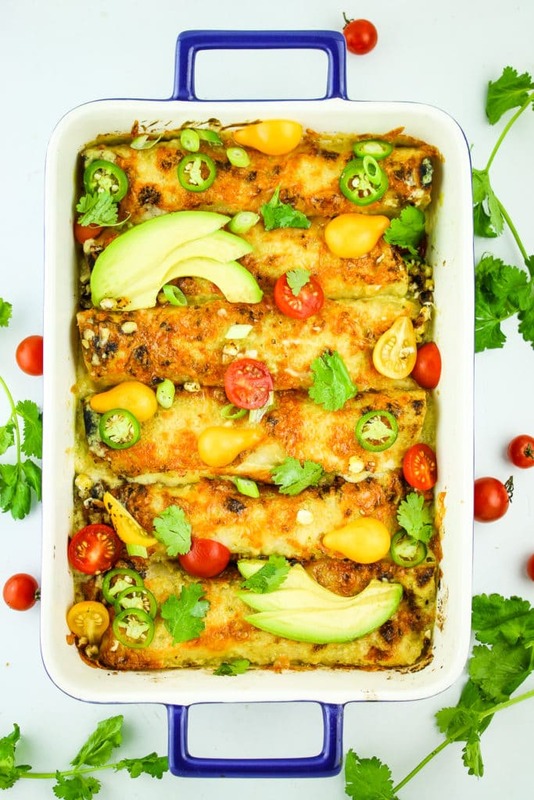 These vegetarian enchiladas are topped with an amazing avocado cream sauce. 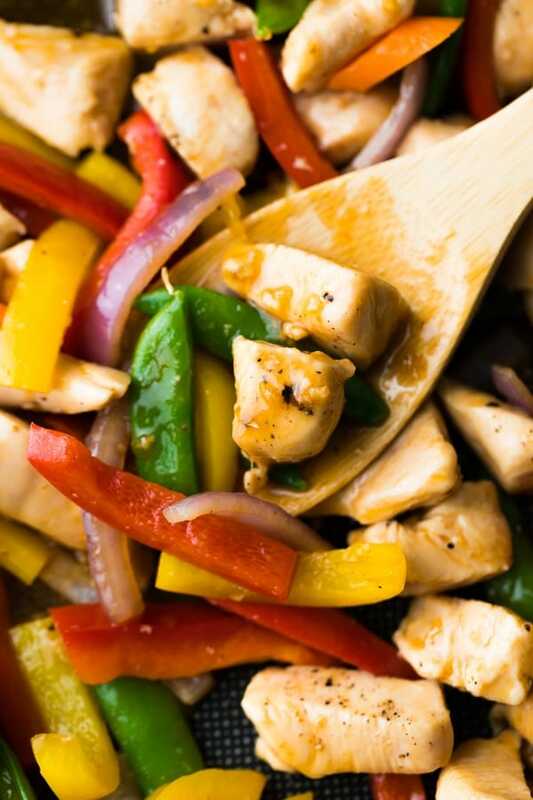 This easy chicken stir fry is perfect for busy weeknights. Leftovers also make great meal prep! Click here to get the recipe from Sweet Peas and Saffron.